Albia is secretly the daughter of Macbeth, but thanks to a deformity at birth, she was taken away from Lady Macbeth and secretly sent to live with three mysterious sisters. There, she lives quietly, until disorder comes to Scotland and Macbeth wants to consult with these sisters to learn his fortune. Albia is sent away and she falls in love her father's opponent...and discovers strange powers. She must make a choice--become involved, or ignore what she foresees. Lady Macbeth's Daughter is a riveting, interesting, and very entertaining story that is complex, yet is seamlessly aligned with William Shakespeare's Macbeth. 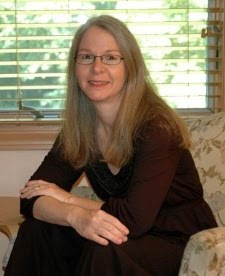 Albia is a strong, likable heroine, and her story and voice are compelling. Klein's writing is very detailed, and the novel develops between two points of view, Albia's and occasionally Lady Macbeth's. There is a lot of character growth as Albia matures and learns the truth about her parents and their natures, and also grapples with her feelings for Fleance. Though the romance was not especially deep or memorable, it was sweet. Klein's novel is very clever and one can't help but admire her for the way she builds her characters, each event in the book somehow shaping and forming who they are and how the act. Her character development and more in depth examination of these characters may be interesting for some, as Shakespeare oftentimes leaves his character motivations vague and undefined. After reading this story, readers may come away with a better understanding of each character and the story of Macbeth. This is a very insightful, remarkable read. Cover Comments: I do like this cover, I think it is attractive without being too busy, and the sunlight on the model's hair is a very neat look. This isn't extremely remarkable, but it suits the book nicely. What inspired you to "add to" the original tales of William Shakespeare? I've long had this kind of "hero worship" of Shakespeare. He is one person I'd like to meet in the afterlife. Or I'd like to time travel to Elizabethan London and follow him around, go to all his plays. My own rewriting of Shakespeare's stories is an effort to understand and participate in his creativity. But being a woman born in the twentieth century, my focus and purpose differ. I want to retell the play from the perspective of female characters that I don't think Shakespeare understood very well--or cared all that much about, except as they set off his tragic heroes. What sort of research went into writing Lady Macbeth's Daughter and Ophelia? For Ophelia, which I set in the late 16th century, I relied on what I already knew, since my PhD was in English Renaissance literature. But I also had to research herbal cures, the architecture of castles, convent life, and so on. Plus, I studied Hamlet backward and forward, so I could understand how Ophelia's story would fit in, and where it would depart. Because Lady Macbeth's Daughter was set at the actual time Macbeth lived (1000 years ago! ), it was harder to research, because there are no written records from that time. So I read what archaeologists and historians had uncovered, I studied the Highland folklore and folk ways (which remained unchanged for centuries). Most importantly, I traveled to Scotland and visited ruins of ancient forts and stone circles, and forests and bogs, which became key elements of the setting. When it come to Macbeth and the witches, an eerie, supernatural setting is everything! Is it hard to stay true to the stories Shakespeare wrote and still tell your own story? Good question! It's a challenge, but one that I enjoy. I respect Shakespeare so much that I don't want to change his plays just for the sake of making my story work. That feels like cheating. In Ophelia I wanted to show readers the possibility of her heroism and survival, in contrast to Hamlet's degeneration and death. In the case of Lady Macbeth's Daughter, I want readers to feel like my character Albia helps to explain the violent, tragic behavior of Macbeth and his wife. My two novels are by no means retellings, but Shakespeare is very much the inspiration and foundation for them. 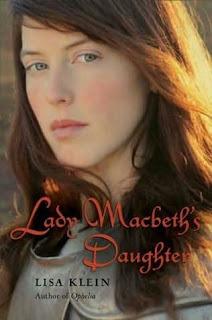 Are you planning on writing any more books similar to Ophelia and Lady Macbeth's Daughter? Yes, but I think I'll move away from tragedy and try my hand at something lighter. Don't you agree? I enjoyed this book and others by the author quite a bit!! great review. Good interview. I picked up Ophelia last week at the library and can't wait to read it.